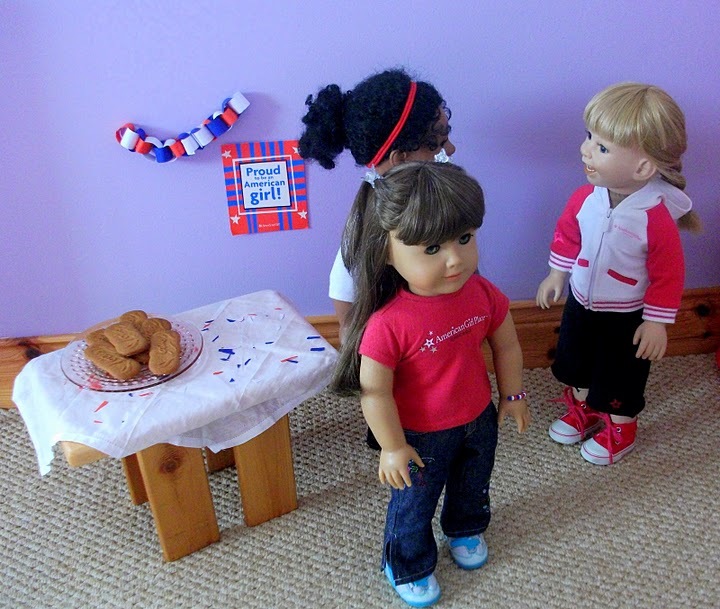 TODAY MARKS THE FIRST YEAR ANNIVERSARY OF AMERICAN GIRL DOLL CENTRAL!!!! CAN YOU BELIEVE IT’S BEEN A YEAR?!?!?!?!?!?! WOW! I am so happy because I got back from the beach today, we means I AM here for the anniversary!!!!! I am so excited! Here’s a little history of my blog. As everyone says when their blog hits its anniversary, I started this blog having no idea what it would be like. I didn’t think it was too great, I didn’t know if people would like it or even view it, and I wasn’t sure about anything. Before I started this blog, I admired so many others and said one day, “Hey, maybe I could do that.” I asked my dad how to create a website, and he told just to punch in: “Make a Website for free.” So I did. I tried so many blog-maker-things-or-whatever-you-call-them, but nothing seemed to work for me. ( In fact, there are actually Blogger, Webs and more AGDC sites with nothing on them!!!!) I almost gave up, but then WordPress came along. It was easy, fun, and seemed very simple. So when I got my URL, I made a little post. 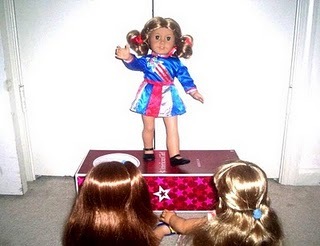 It was just saying stuff like “This is American Girl Doll Central” and “I hope you like my website.” and things like that, along with a blurry picture of my dolls and my friend’s two dolls. Then I got a little creative. I toyed around with my website and figured out how to tweek the appearance, add links and categories, and more. My very first photo story was, I believe, about Eva Grace celebrating Pink Day. You could barely call it a photo story, based on what I have now. 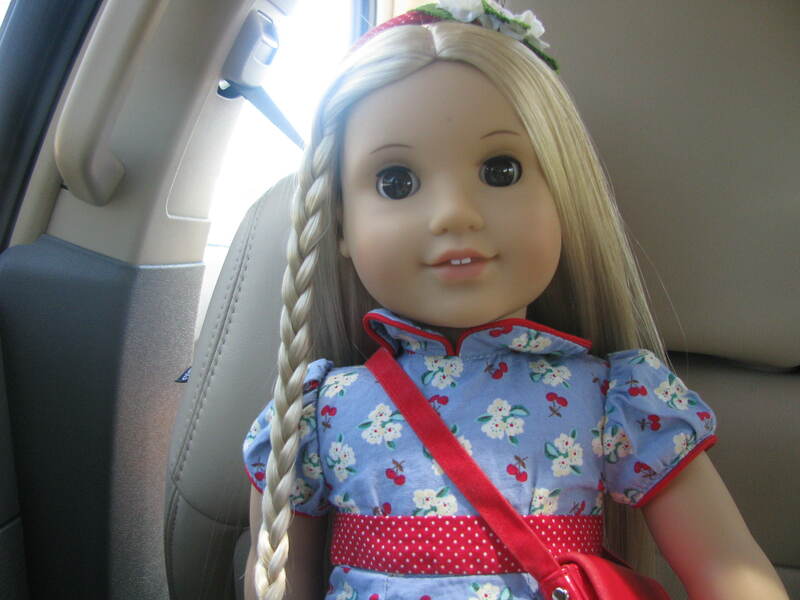 But I thought it was pretty good, and I made adventures of my friend’s Kit doll traveling to my house. Soon, lots of people started to visit my site! I wasn’t sure what did it, but people from other doll sites started to comment regularly. Soon, I was becoming a real website owner! It was so fun adn I would log on every day after school and enjoy reading emails and new comments. If you have a blog, you know how great it feels to get positive comments and emails. Some people now have even asked me for advice! I feel great to be someone that other girls can ask advice. And, I’ve gained SO MANY FRIENDS!!!! I’ve never seen some in real life, but it’s pretty cool because I have some great online BFF’s (whom I really want to meet someday)! Oh, and let me say another time: YOUR COMMENTS COUNT! I LOVE to receive comments on anything- my blog, my picasa, my youtube……and I will try my best to reply to them! So comment! 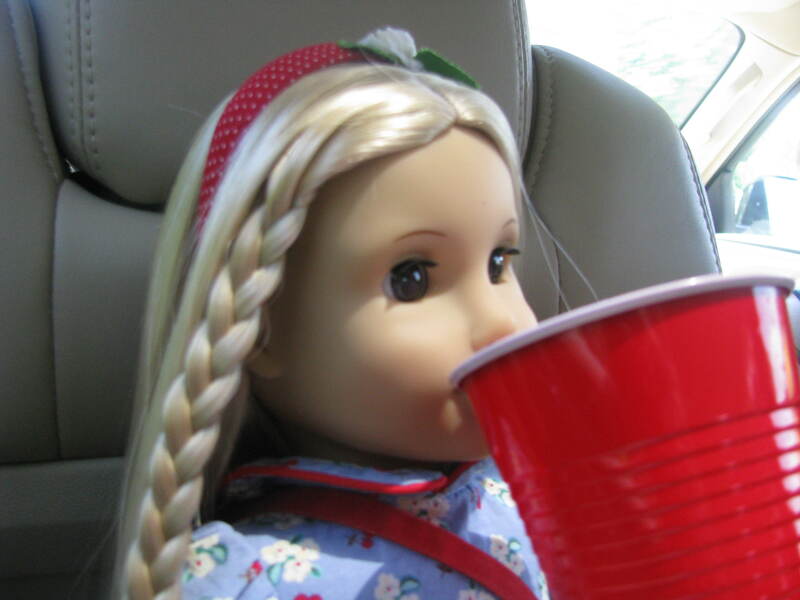 Q: The name of the site is American Girl Doll Central. Why is the URL “americangirldcentral” and not just “americangirldollcentral” or “americangirlcentral”? A: In the process of trying to create a blog, I created a wordpress. “American Girl Central” was what I wanted to call my website. 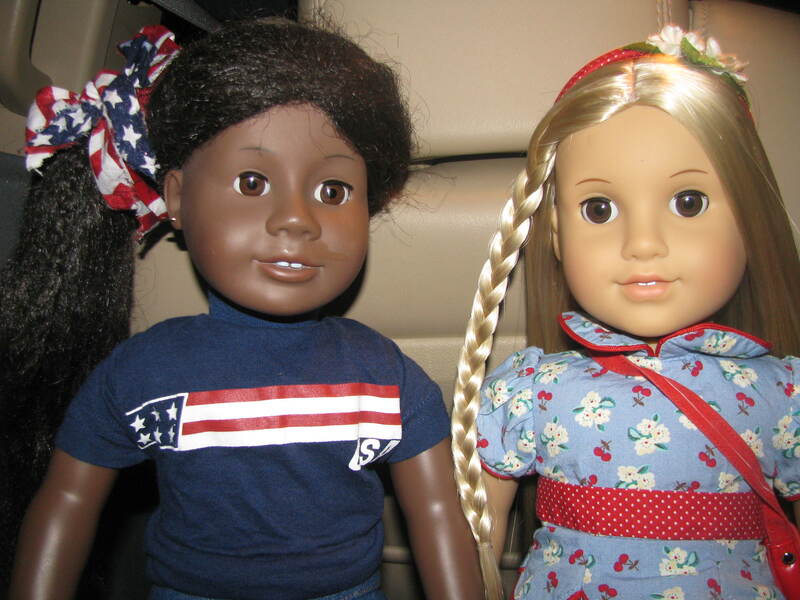 Americangirlcentral was already taken, so I decided to make it “American Girl DOLL Central.” And at first, americangirldollcentral WAS the URL. But for some reason I lost the password to it, so I couldn’t log into it. I just decided to make a new one. Of course, americangirldollcentral was “already taken” so I had to just leave it a d, apparently. Thank you ALL for making this site possible. Yes, it’s you, the friends and fans, that make me love to blog. Hey everyone! My sister comes back from Nicaragua today! Thank you for all your prayers and have a blessed day! But this post is mainly about InnerStar U. I just bought the starter kit! I earned the money and my mom ordered it, so hopefully it’s on it’s way! I can’t wait! You can check to see what InnerStar U is like on Liz’s website, American Girl Fan, here. I noticed that some of you had questions and complaints about InnerStar U, and I’m here to help. I’m sorry about how you feel! 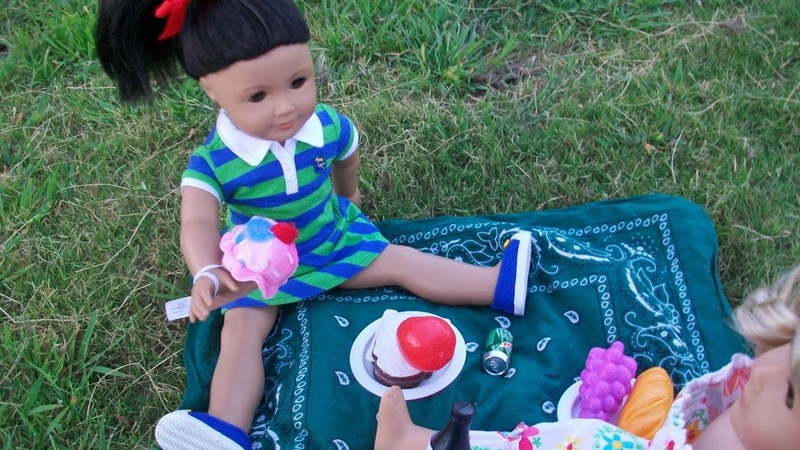 Actually, your daughter doesn’t have to purchase another doll. She can get the starter pack for $10 (free shipping). If she has only historical dolls, that is also OK. 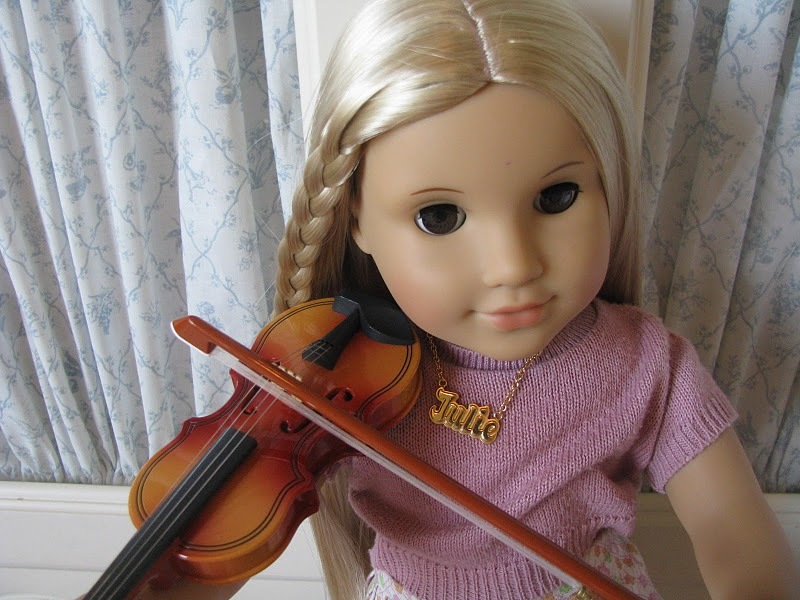 Historical Dolls are not featured on the site, but she can create a virtual MyAG. If you still are not sure, you can try out the free demo at American Girl.com. Hew608, you can buy the starter pack HERE. Hope this helps! IF ANY OF YOU HAVE MORE QUESTIONS, I WILL BE HAPPY TO ANSWER THEM! PLEASE COMMENT BELOW. One of my BFFs on the internet, Leanna, has made a website. She has been on here for a while and has a picasa, but she is going to make her very own website!!! She and I would appreciate it if you went to her website! It’s new so there’s not much to see right now, but she hopes to post more, so be sure to be checking!!!! It’s called Me and My Dolls. Hey! 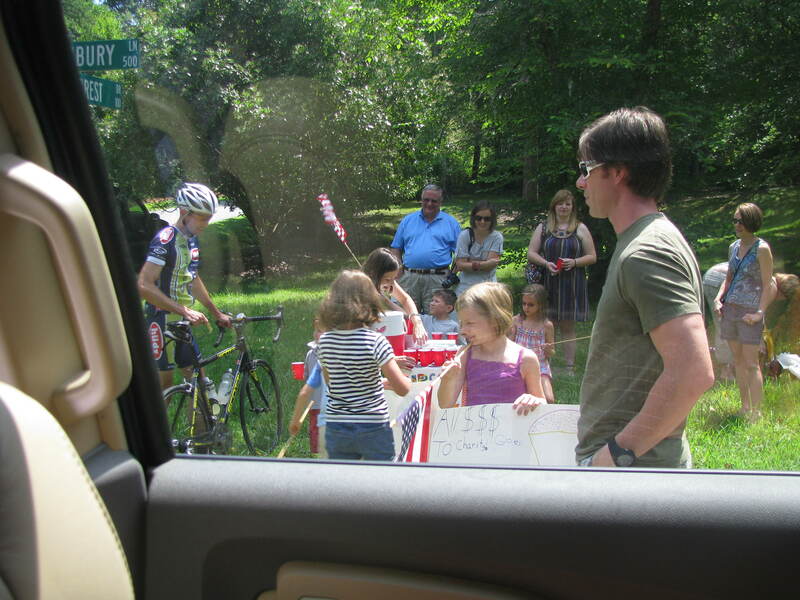 You know my July Fourth photo thing? I am extending the deadline to July 10, 2010. Not much people have been sending their pictures, so please, do so! They can be ones you have already used for a photo story or another contest! So don’t be shy! Get those pictures in and they’ll be displayed here! For more information, scroll down!